Posted on April 25, 2014 by Worth Stopping By . . . I love the name of this dish – Beets ‘n’ Sweets. 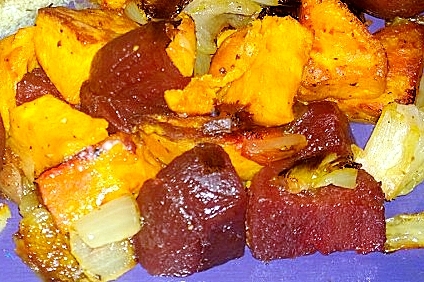 It’s a very simple recipe (allrecipe.com) — sweet potatoes, beets, onion, spices — done. Just roast the vegetables until tender and you have a beautiful, healthy side. It was delicious served with Pepper-Crusted Filet Mignon, but I think the colors of this dish make it a perfect accompaniment for fall dinners. 2. In a bowl, toss the beets with 1/2 tablespoon olive oil to coat. Spread in a single layer on a baking sheet. 3. Mix the remaining 2 tablespoons olive oil, garlic powder, salt, pepper, and sugar in a large resealable plastic bag. Place the sweet potatoes and onion in the bag. Seal bag, and shake to coat vegetables with the oil mixture. 4. Bake beets 15 minutes in the preheated oven. Mix sweet potato mixture with the beets on the baking sheet. Continue baking 45 minutes, stirring after 20 minutes, until all vegetables are tender.